Unfortunately, there is little good news to report from Tortola. There are still almost 4000 people reported missing. The hope is that the people are there and have survived, but just don't have a way of communicating. Reinforcements have arrived - the basics, water etc. but still, people are desperately trying to get off the island. Communications are difficult, power is out and water isn't running on much of the island. This means sanitation levels are not good. Meanwhile, flights in and out of Tortola's Beef Island Airport are few and still restrained to emergency/relief flights. 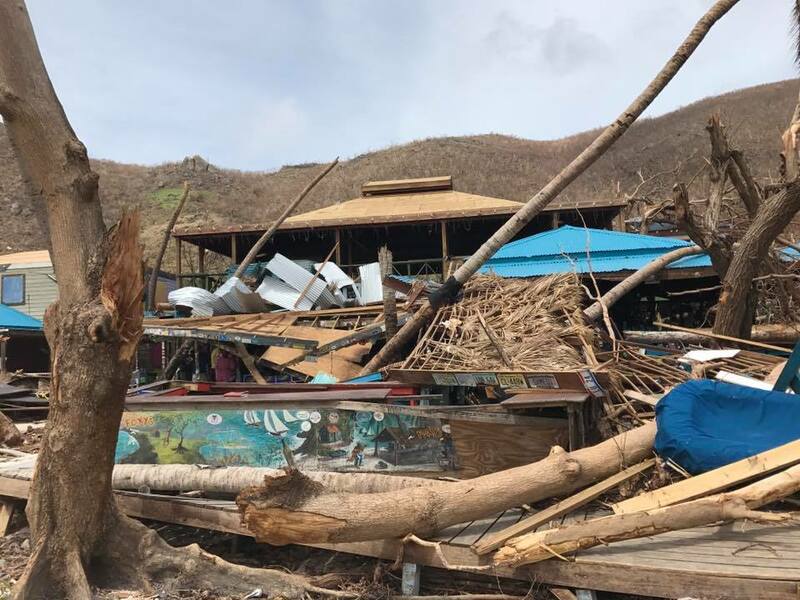 The ferries that weren't wrecked in the storm aren't much help because they don't have anywhere to travel to - the situation on St. Thomas is just as dire. We've seen a note by a person on the BVI Abroad Facebook Group that states that winds during the eyewall were sustained at 185 MPH with gusts up to 220. To compare, Irma's winds at landfall in Florida were 120 with gusts to 150. Crazy. Roads are mostly passable. In the photos and videos we've watched, there are cars driving along Sir Francis Drake Highway. Road Town looks to be in worse shape than we originally thought in our earlier report. There's an excellent but disturbing youtube drone video of the damage here. Thankfully, cruise ships are due to land in both Tortola and St. Thomas to attempt to take Irma victims to the US (news about this, here) while bringing in emergency relief. Also, Puerto Rico has been spared by Irma and can act as a safe location for the Caribbean islands hit by Irma. Meanwhile, Richard Branson is working on a solution to help restore the Virgin Islands. The story about this effort is here. Richard has also setup a new relief organization where 100% of the donations go to support the BVIs. It's part of Virgin Unite - link here. If you are wondering about the status of the vacation resorts, we have started to make calls around. Many are in bad shape. 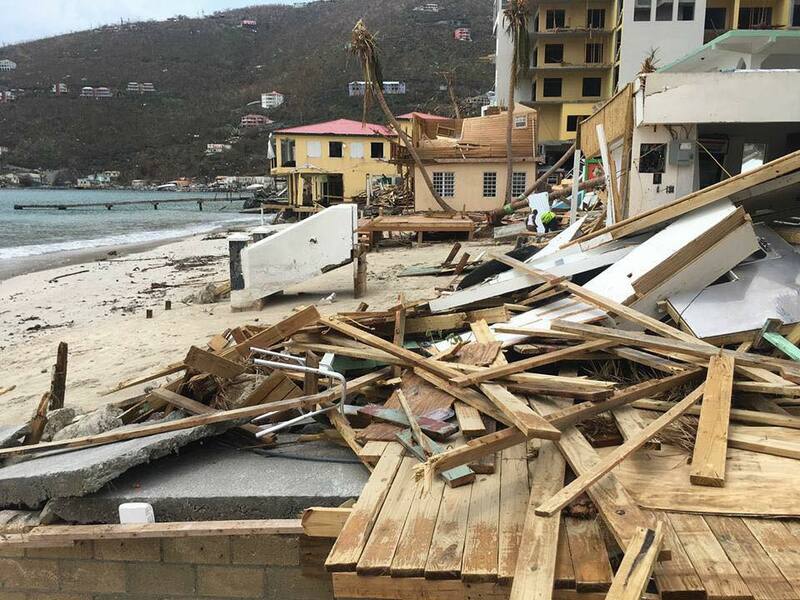 We did speak to the folks on Peter Island who said that while damage is severe and they are closed at the moment, they believe they will be back functioning in the near future. We'll end this report with some photos of the destruction. Below is our earlier report, with more pictures. Jost Van Dyke's Foxy's Bar - not destroyed but in bad shape. 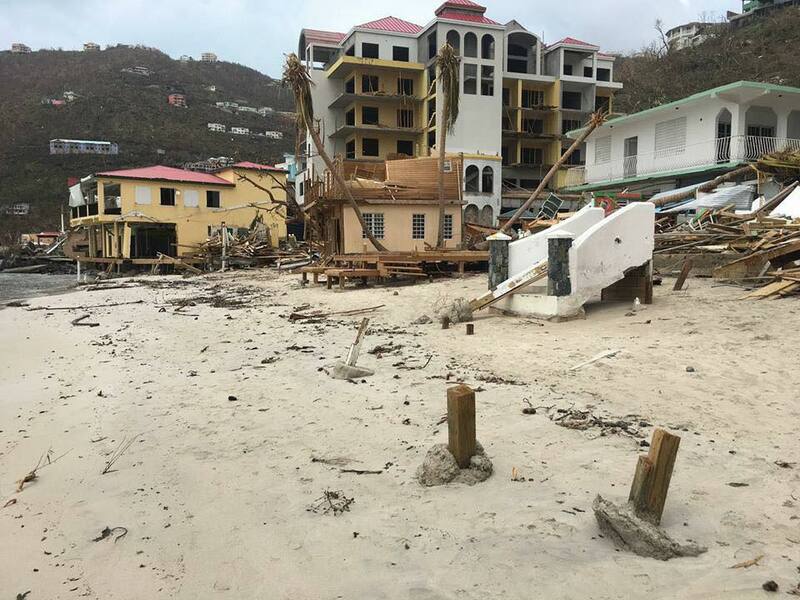 Reports and photos of the destruction from Irma have started to come in from Tortola and the BVI and the news is not good. Communications have been down since mid morning on September 6, so getting full reports of the status of the island has been very difficult. The most startling are the photos of the countrysides with homes that are completely gone. 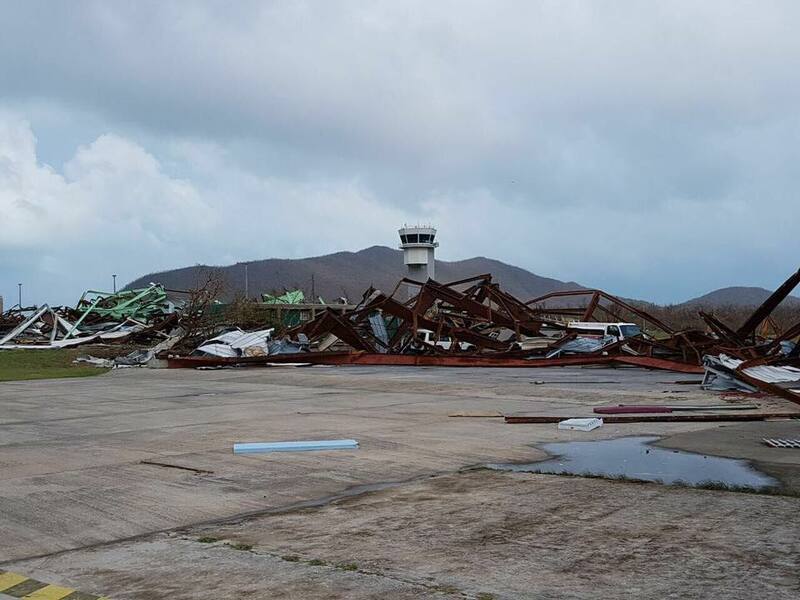 Also, the photos from the harbors and inlets that protect the BVI's charter fleets show devastation to the BVI's charter industry. Hundreds of boats are severely damaged, sunk or lost in numerous locations around the island. 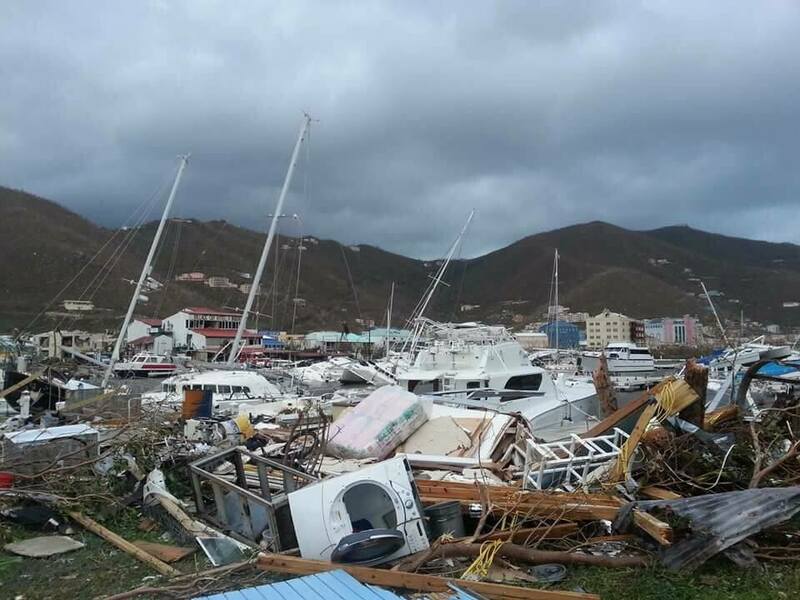 We are particularly worried about the BVI/USVI ferry fleet. We've seen several ferry boats that look to be totaled in the photos. This region relies on its ability to get around the islands for both natives and tourists. We've seen numerous photos of roads being washed out along the Drake Channel on the south side of the island, along the Drake Channel. 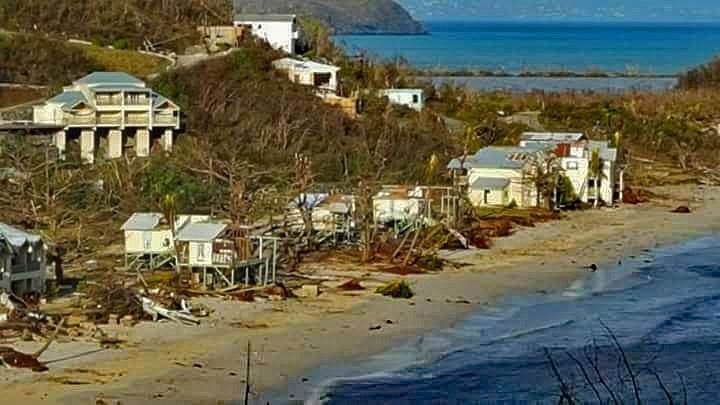 Below are some photos of Cane Garden Bay - it is in terrible shape. However, we do see people in the photos walking and biking around. That's at least comforting. The airport re-opened this morning, but only for emergency flights, not general aviation or commercial flights. See the photo below of the airport with demoed buildings along the taxiway. And thankfully, Hurricane Jose is trending northeast of the BVIs and Tortola and just the outerbands of its tropical-storm-force winds will touch the island. Obviously not perfect news but certainly not as bad as it could be. 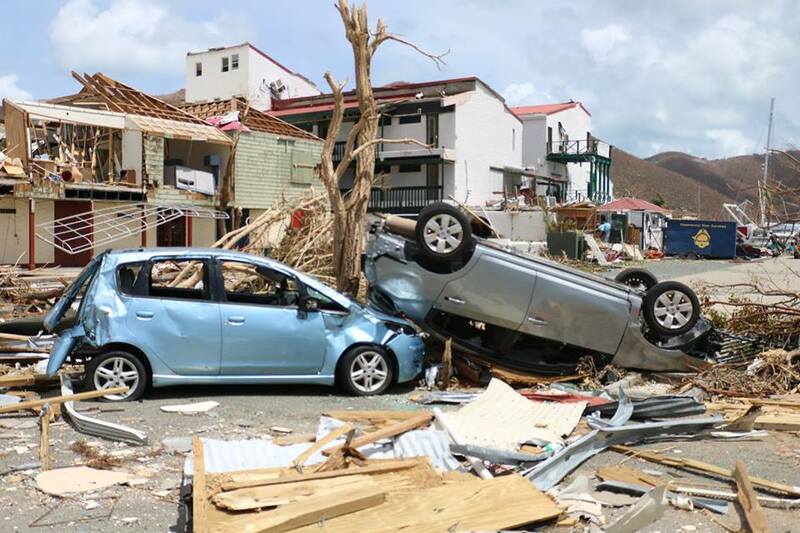 To help support Irma's victims in the BVI and the USVI, please donate to the British Red Cross or the American Red Cross.